I know I said I’d start this blog with a series on my recent gin tasting. but I had a drink the other night that reminded me of one of my all-time favorites and I need to sidetrack a bit before I even start…. Shortly out of high school, I lived (as many kids do), with the exhilaration of new-found freedom. I had my own apartment, car, and a job to pay for those and m y college classes. While it was a busy life, I still had time for friends and music, two passions that I enjoy even today. About this time I discovered The Eagles. They were long past their glory days —hell, both Don Henley and Glenn Fry had successful solo careers by then. But I bought their Greatest Hits albums and played them endlessly in my ’72 Chevelle. Tequila Sunrise was one of my faves. At some point, I realized this was also the name of a cocktail (few have accused me of being smart). So the next time I was in a bar in Canada (the drinking age was only 19 up there), I ordered one. What came out was surely over-sweet, with way too much bar-gun OJ and nasty Rose’s grenadine covering up harsh well tequila. But if you make it right, a Tequila Sunrise is a slightly sweeter variation of the screwdriver that looks cool in the glass. The recipe below will get you there. A Tequila Sunrise is bar-orderable, as long as you understand that you’re either going to micromanage the bartender so much that he’ll spit in your drink or you’ll end up with something of much lower quality than you’re used to at home. Since neither of these options is attractive to me, my bar drink list is quite short. But this could easily make a slightly expanded list. Fill a chilled highball glass with ice and pour grenadine over the ice. Garnish with a cherry or two. 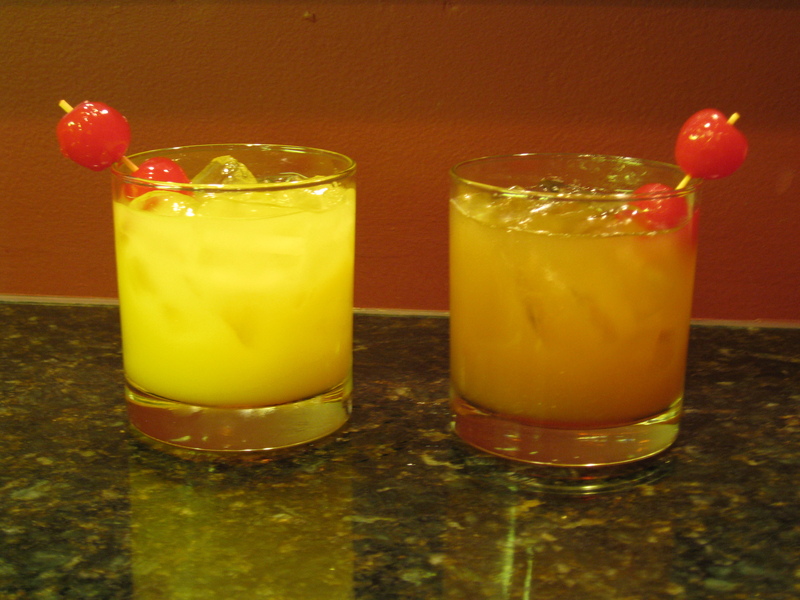 Combine tequila and orange juice in a separate glass (mixing or otherwise). Swirl a little to mix the ingredients and pour over the ice and grenadine. This will give the drink the layered look that inspired the name. What makes it good: fresh OJ is a must, although less so for this and screwdriver than it is for say a Bronx Cocktail. But once you’ve had a good one you’ll definitely notice the difference. Other than that is it a basic highball, and most highballs I like @ a 1:2 ratio of liquor to mixer. You can certainly vary this to your taste. If you’re looking to make this a little ‘taller’ to weaken the alcohol content without making it to sweet, I would recommend adding 1-3 oz of club soda, rather than adding more orange juice. Simply change the glass to a Collins, perform the steps in the recipe, and pour club soda over the top at the end. Some people will use 7up for this, but I find it WAY too sweet…. Combine ingredients in shaker, shake for 30 sec+ and strain over ice in a chilled highball glass. You can fish out the pepper slice for garnish. Or add a sprig of mint to the glass. r about them and insist on gourmet brands, I haven’t found the additional expense and trouble to be worth it. One thing I do, though, to prevent maraschino messes: I purchase stem-less cherries and stab a couple on to a toothpick for each drink. If you’ve ever hosted a party and had to scrub cherry stems off of your hardwood coffee table the next morning, you’ll understand why I go to the trouble. I no longer drive a Chevelle, and my taste in cocktails has refined a bit. As a result, I’ve played around with variations on the classic, and came up with one I like a lot. The jalapeno adds a touch of spice, and the vanilla gives the drink the feeling of sweetness without actually adding any sugar. It is not a spicy drink like the Ring of Fire (coming in a future post). But it is a sophisticated variation on a classic that will impress your friends…. Layer over ice in a highball glass just like in the Tequila Sunrise. Garnish with cherries. And don’t let me forget to talk to you all about grenadine someday…. This entry was posted in Uncategorized and tagged Cuban Sunrise, grenadine, jalapeno, Maraschino Cherry, Myer's Rum, orange juice, pineapple juice, Spicy Sunrise, Tequila, Tequila Sunrise, vanilla. Bookmark the permalink.